The Greater Short-toed Lark or sometimes just Short-toed Lark (but see below) is a small passerine bird. It breeds in southern Europe, northwest Africa, and across temperate Asia from Turkey and southern Russia to Mongolia. It is sometimes considered conspecific with Calandrella cinerea. During migration they form large flocks that fly in synchrony and at other times they form loose flocks. Several subspecies have been named but there is considerable geneflow and the species itself forms part of a larger complex. This is a small pale lark, smaller than the Skylark. It is dark-streaked greyish-brown above, and white below, and has a strong pointed bill that is pinkish with a gray culmen. It has a pale supercilium, dark patches on each side of its neck and a dark tail. Some birds in the west of the range have a rufous crown. The sexes are similar. Subspecies longipennis is paler than dukhunensis which also has a shorter bill. In winter they fly in large and compact flocks that swing in synchrony. Care must be taken to distinguish this species from other similar Calandrella larks, such as the Lesser Short-toed Lark, Calandrella rufescens. The nominate form breeds in Europe (Iberia, France, Italy, the Balkans and Romania) and winters in Africa. Subspecies hungarica breeds in the eastern parts of Europe while rubiginosa breeds in northwestern Africa. Subspecies hermonensis (sometimes including woltersi) breeds in Turkey, Syria and Egypt. Subspecies artemisiana (considered by some to be synonymous with longipennis) breeds in Asia Minor and winters in southern west Asia. Subspecies longipennis breeds in Ukraine, Mongolia and Manchuria and winters in South Asia mainly in the drier zone of northwestern India while dukhunensis breeds on the Tibetan plateau and winters mainly in peninsular India. The song varies between a dry twittering and a more varied and imitative melody. Flocks will often fly together to water in the mornings at favourite spots. In the evenings they roost in open ground, with each bird squatting in a small depression made in the soil. All but some southernmost populations are migratory, wintering south to the southern edge of the Sahara and India. This species is a fairly common wanderer to northern and western Europe in spring and autumn. Populations breeding in the Iberian Peninsula winter south of the Sahara in Africa. 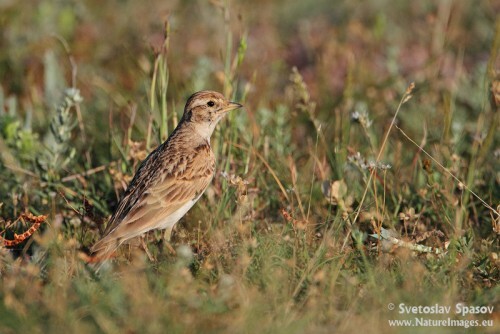 Here they prefer crop land and dry pastures with short shrubs while the syntopic Lesser Short-toed Larks (calandrella rufescens) prefer drier areas. This is a common bird of dry open country and cultivation. It nests on the ground, laying two to three eggs. Its food is seeds and insects, the latter especially in the breeding season. In Colonial India, they were hunted for food as Ortolan. They visit parts of South Asia in large flocks during winter and are sometimes attracted to short grass areas along aerodromes and become a bird strike risk to aircraft.